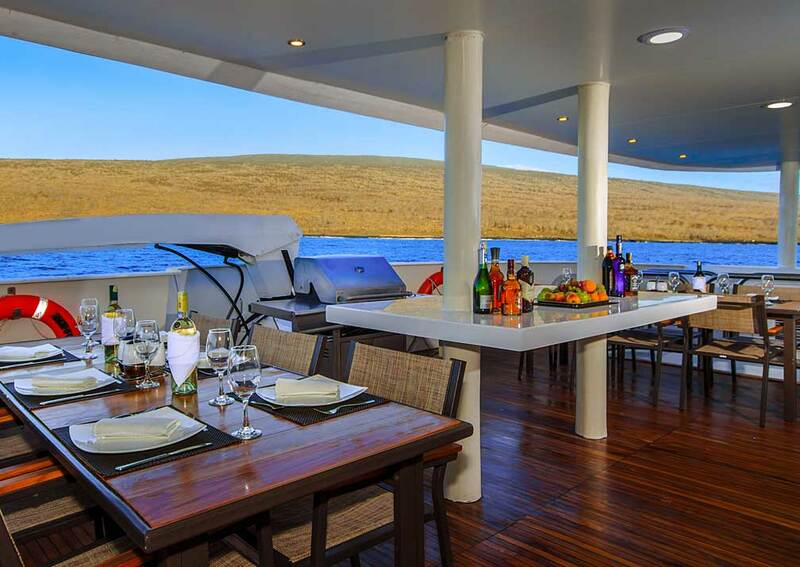 A luxury catamaran build for Galapagos cruising. Cruise in style & comfort, looked after by an attentive yet discreet crew. 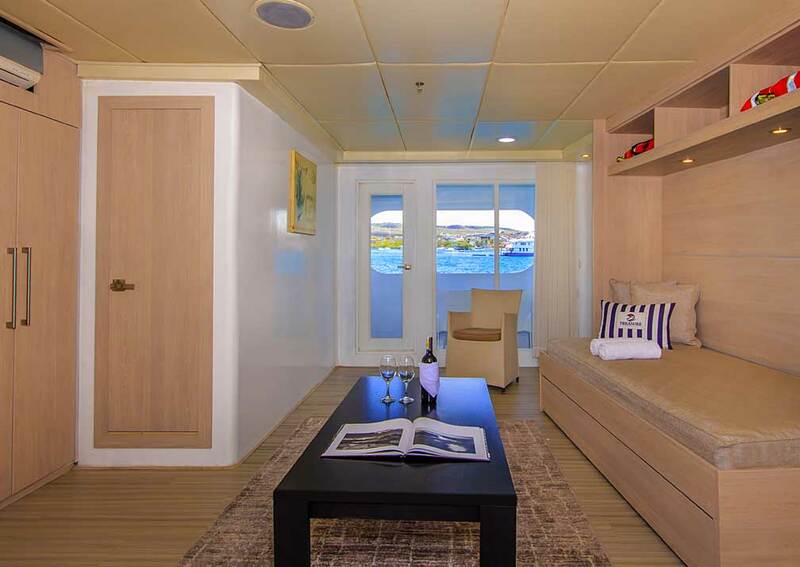 A luxury catamaran built for Galapagos cruising, with 9 suites, all with balconies, beautifully furnished interiors and lots of deck space. You’ll be cruising in style and comfort, looked after by an attentive yet discreet crew. 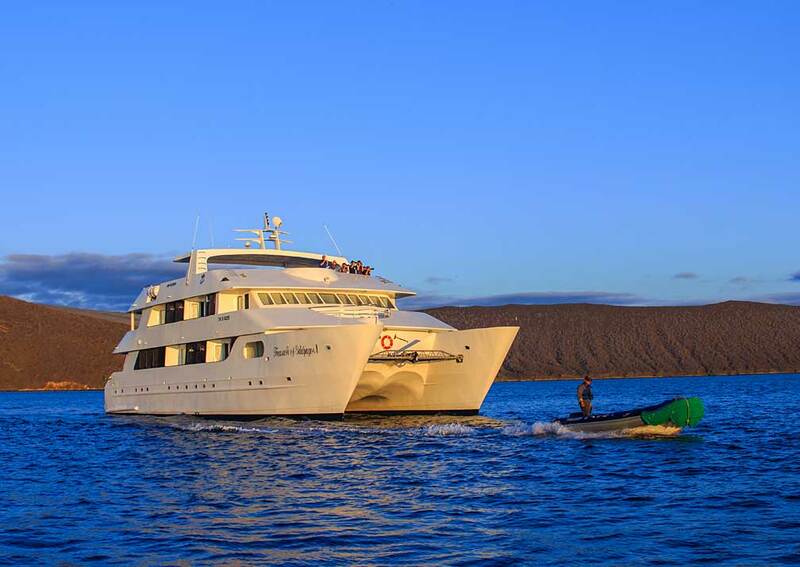 Treasure of the Galapagos is a modern catamaran operating in the Galapagos since 2010. She provides a stable ride and high levels of comfort. 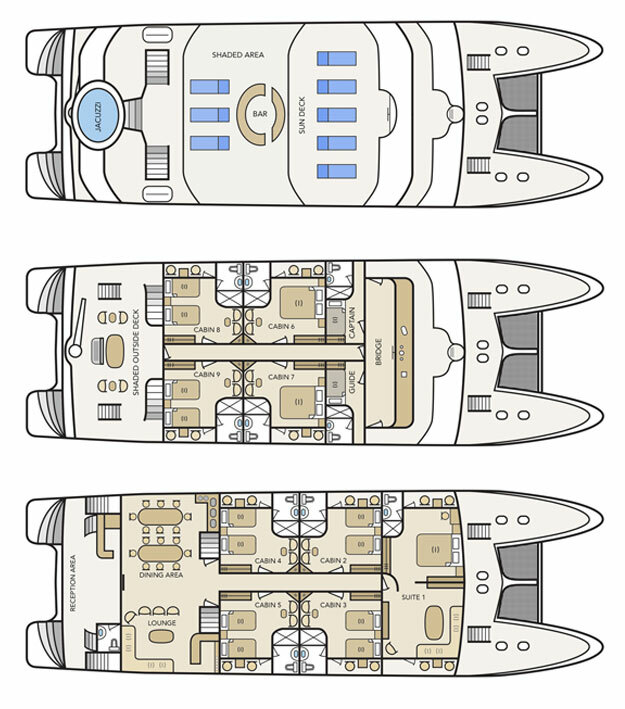 Cabins are large and well designed. The décor is contemporary and subtly sophisticated, using soothing shades of chocolate or cream, and soft lighting provided by ceiling lights. There’s plenty of room to store your belongings for the voyage. Bathrooms have porcelain hand basins, flush toilets and full size showers. 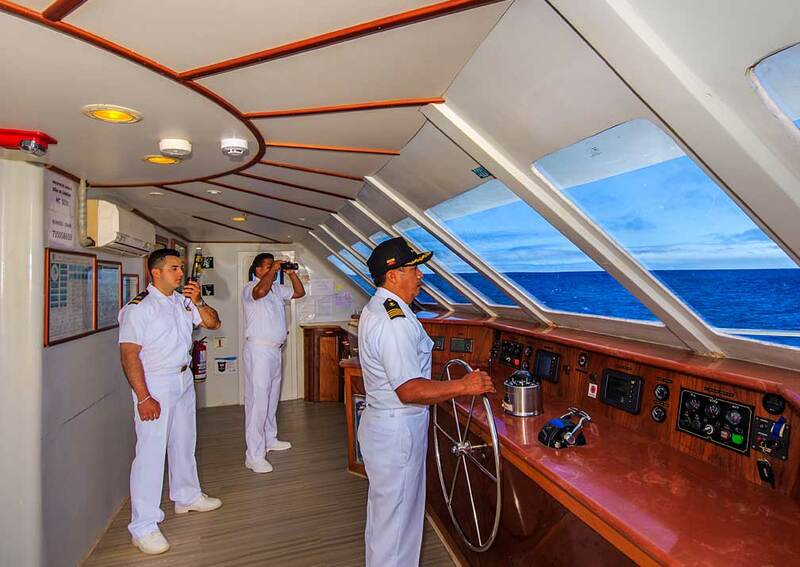 Each cabin has floor-to-ceiling windows and a private balcony where you can sit and look out at the changing scenery. Most meals are served at 4 small tables each seating 4 in the dining room, though informal barbecues take place on the sun deck, cooked in front of you and eaten al fresco. Tea and coffee are available all day. 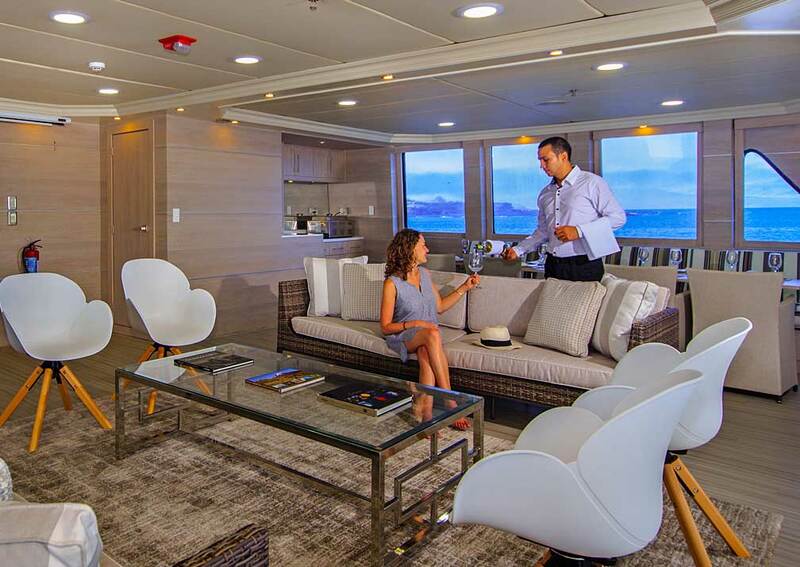 The spacious lounge spans the width of the vessel and has sofas and tub chairs and you’ll have your daily briefing from the guide here in advance of each island visit. The library has a selection of books and DVDs for you to enjoy. 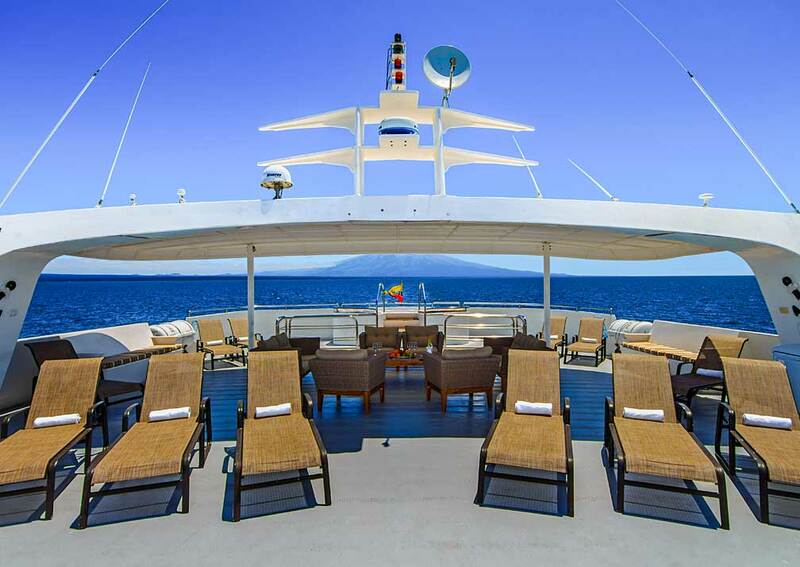 The upper and sun decks include a shaded outdoor lounge and an uncovered space where you can recline on one of the loungers and work on your tan. 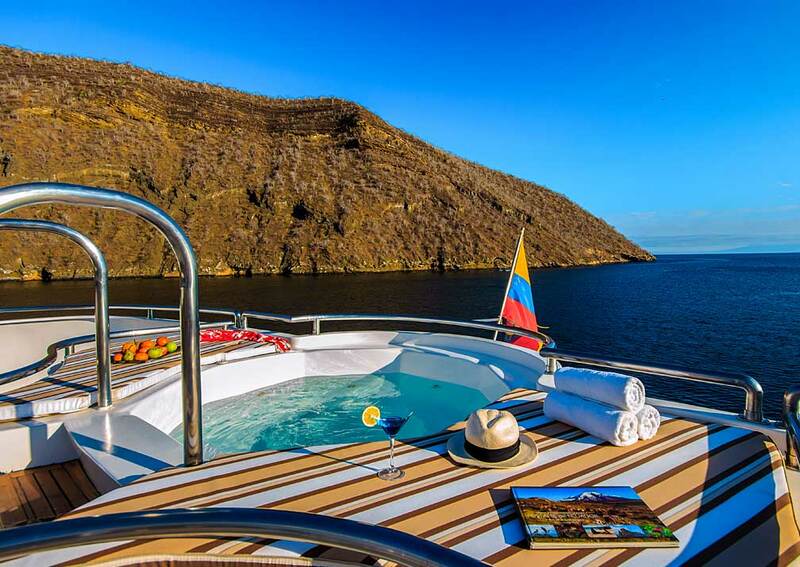 Sitting in the hot tub at the stern is a wonderful way to relax, while enjoying the ocean views. 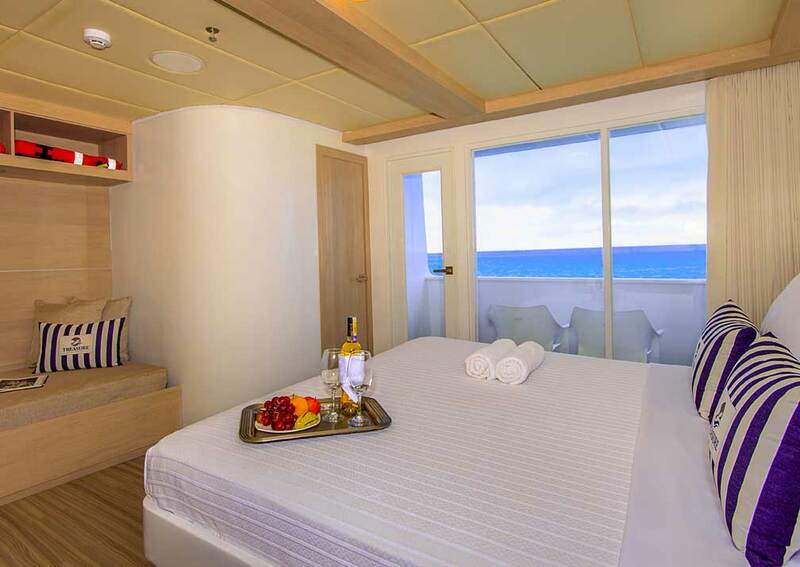 There is 1 master suite on the main deck with a total area of 40 square metres. It has a queen size bed, living room with a sofa bed, private shower room with hot and cold running water, hand basin and toilet, and can be used as a family suite to accommodate up to 4 people. There is a closet and storage for luggage, bedside tables and individual air conditioning. 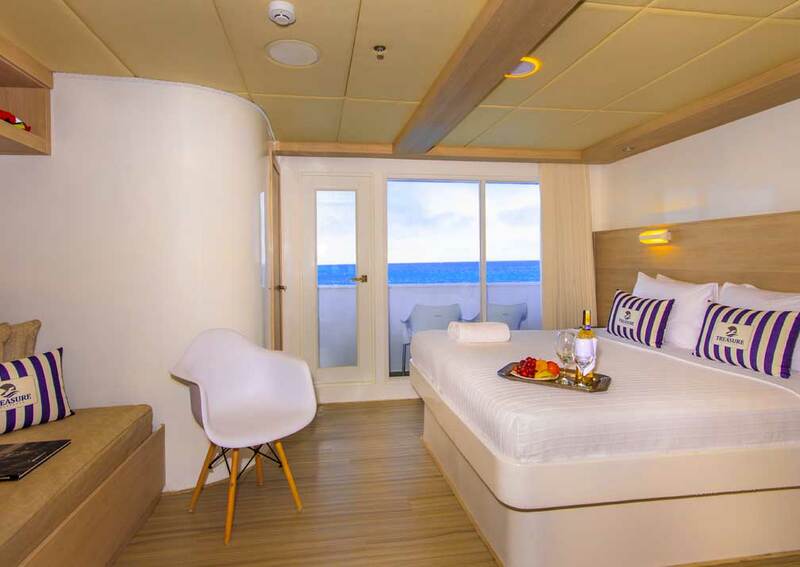 The suite spans the width of the vessel and has 2 balconies. 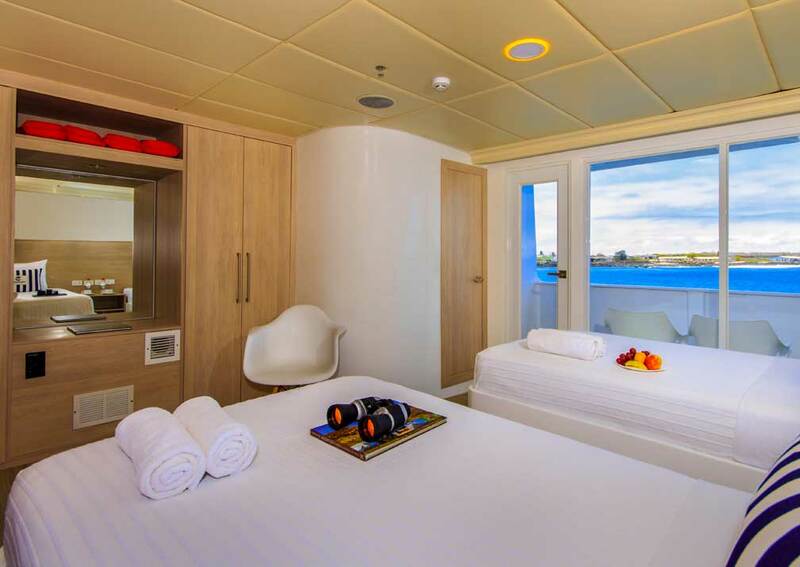 There are 8 junior suites, 4 on the main deck and 4 on the upper deck. Of these 2 have queen beds and 6 have 2 twin beds, and all have an area of 20 square metres. 3 of these suites can be used as triples. Each has full length windows, a private balcony, indoor sitting area, closet, luggage storage, beside table, safe and private shower room with hot and cold running water, basin and toilet. All are air conditioned, with individual controls. 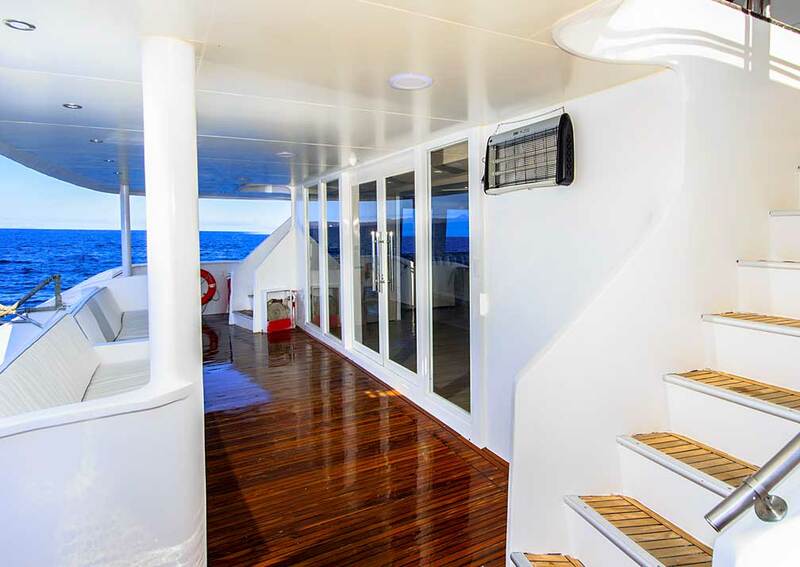 Accommodation: 9 cabins, 5 on the main deck and 4 on the upper deck. All are en-suite with hot and cold running water, air conditioning, safe and balcony. 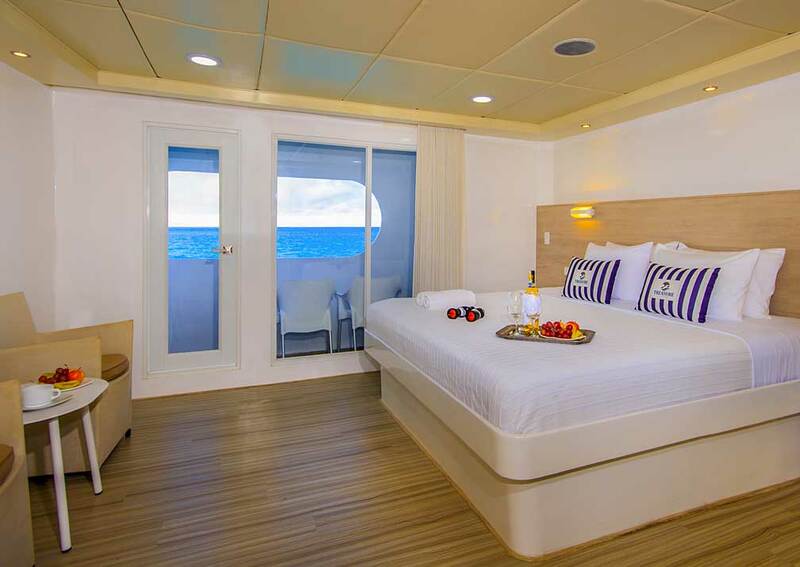 The master suite on the main deck spans the entire width of the vessel, has 2 balconies and is 40 square metres. 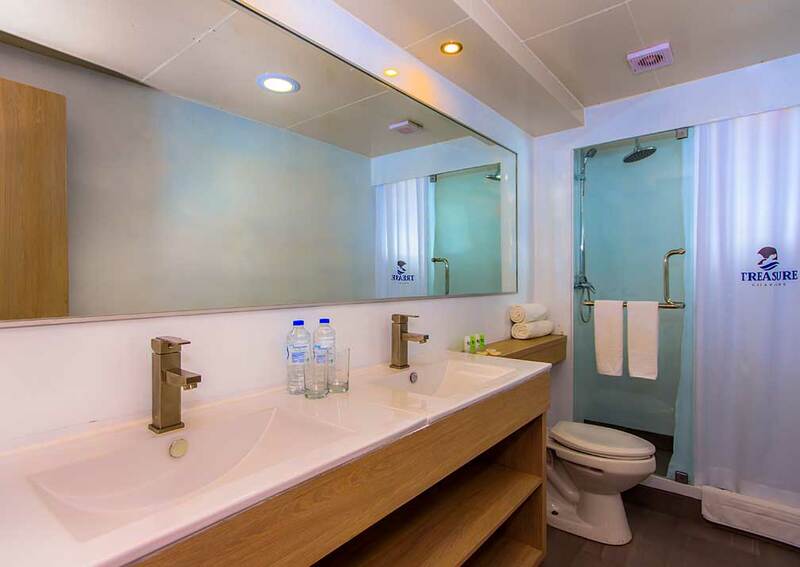 Standard cabins are 20 square metres. 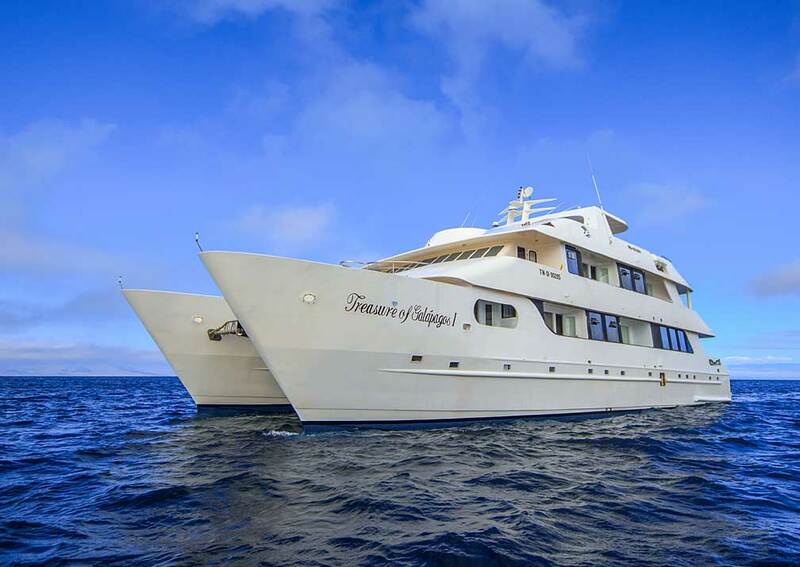 On Board: There is a dining room, lounge, library with TV and DVD player, 2 bars, several deck areas and a Jacuzzi. 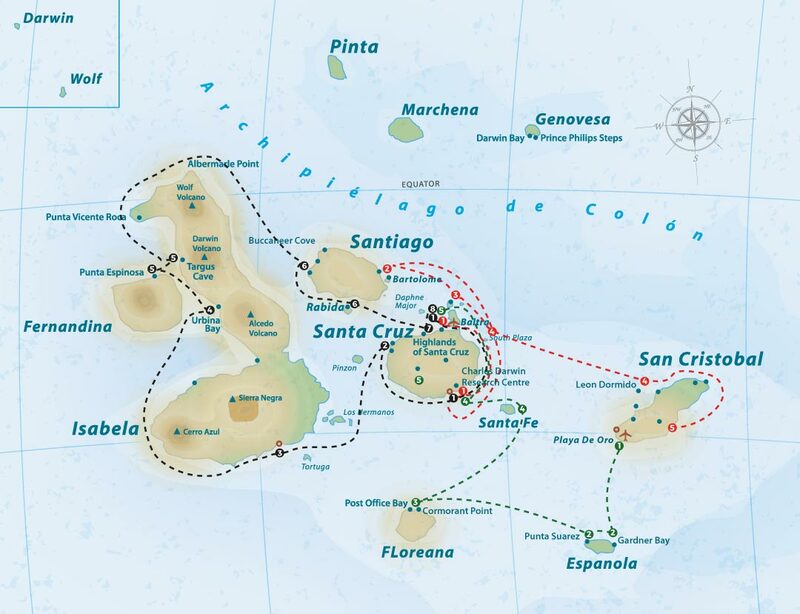 Treasure of the Galapagos carries snorkelling equipment, free for passenger use. Wet suits can be hired.